The golden-backed snipe fly (Chrysopilus thoracicus) is one of the most beautiful insects you'll run across in Ohio forests. 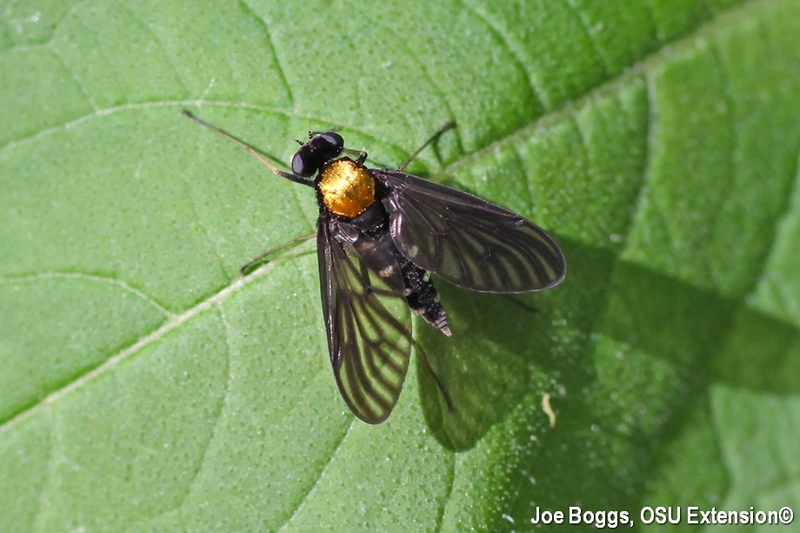 Both the common and scientific names are very descriptive for this native fly. The top of the thorax (= the "back") is covered in highly reflective golden colored hairs; "Chysopilus" means "golden hair." The fly's body and wing veins are bluish-black and the abdomen has lateral white markings. Little appears to be known regarding the fly's life-style. The adults have been observed visiting the flowers of a number of native plants, including elderberry, fueling the speculation that they are feeding on nectar and/or pollen. The larvae live in the soil where it is believed they consume decaying organic matter; however, some reports indicate they may also opportunistically feed as predators on soft bodied insects. Regardless, while the name "snipe" may invoke memories of night time summer camp expeditions to hunt for a mythical creature; daytime hikers in the woods of Ohio don't need to look far to see the real thing … wrapped in a golden fleece.